Spitfire Communications wins 2019 Eddy Award! Home - Press Releases - Spitfire Communications wins 2019 Eddy Award! The Eddy Awards, sponsored by Pension and Investments and presented at P&I’s annual East Coast Defined Contribution Conference in Ft. Lauderdale, FL, honor the plan sponsors and service providers who exhibit best practice delivery of investment and financial education to defined contribution plan participants. 66 defined contribution communication campaigns were honored at the March 11, 2019 annual ceremony. News provided by Spitfire Communications. 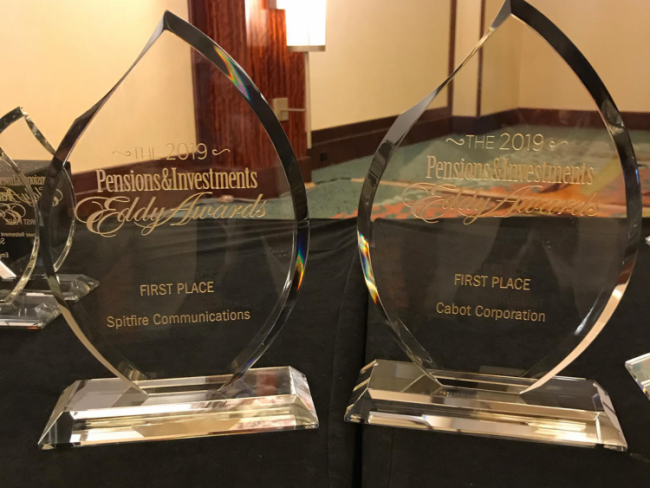 SIMSBURY, CT — At the March 11, 2019 Eddy Awards, Spitfire Communications won first place in the Pre-Retirement Preparation category for their work on Cabot Corporation’s 2018 Retirement Planning Guide. The Spitfire and Cabot collaboration focused on the rollout of a comprehensive retirement savings benefit across numerous communication channels, including the internal employee hub, the Cabot Benefits website, its HR Collaboration site, the retirement page of the 2019 Annual Enrollment Guide and in hard copy form at the 2019 Annual Enrollment Benefit Fairs. To create the Retirement Planning Guide, Cabot and Spitfire set goals to educate and support employees in every stage of the retirement planning process, evaluated the feedback from employees and HR team members about perceived challenges, customized a plan to support the key findings, and engaged with Cabot’s vendor partners to ensure the guide included the most accurate and extensive details about Cabot’s benefits, processes, tools and resources. The final product reflected the strategic vision and successful communications execution required to increase employee understanding and confidence in planning for a comfortable retirement. Cabot and Spitfire Communications have worked together for over 10 years, engaging and educating Cabot employees on all aspects of their benefits packages to ensure optimal utilization throughout the organization. Spitfire shares in Cabot’s commitment to their groundbreaking You Matter Well-Being program, which encompasses an array of employee health and financial wellness initiatives, with particular focus on the retirement planning aspect of Cabot’s employee communications strategy. Spitfire Communications is a full-service employee communications firm creating and implementing communications that assist mid- to large size companies in successfully interfacing with recruits, employees and retirees — through strategy, branding communications and deliverables. Visit www.myspitfire.com to learn more.